With the publiction of several books, author Robert E. Zucker has been providing free book talks and presentations throughout Tucson and Southern Arizona. of the current catalog edition of Arizona Bookshelf. 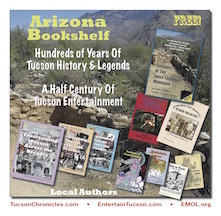 Arizona Bookshelf is a catalog of books published by Robert Zucker and other Tucsonans. By Robert E. Zucker (3 volume set). Thousands of entertainers and hundreds of bands in the local Tucson, Arizona entertainment scene between the 1950s into the 2000s. By Robert E. Zucker, collaborated with Flint Carter. 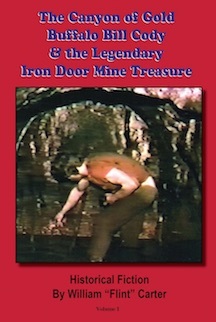 Legends of the lost Iron Door Mine, a lost city and a lost mission in the Santa Catalina Mountains, north of Tucson, Arizona. The story of mining and Buffalo Bill Cody in Oracle. 435 pages. By Robert E. Zucker. Discover the hidden world of Jewish mysticism over the centuries, follow the development of the Sefer Yetzirah, Book of Creation and devise your own Kabbalah Wheel to permutated the 231 Gates. 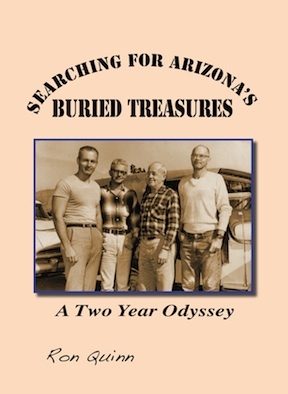 "Searching for Arizona's Buried Treasures"
By Mr. Ron Quinn. Treasure hunting in Southern Arizona, four friends unearth a medium-size treasure south of Tucson, Arizona, which consisted of 82 pounds of Spanish gold bullion. Ron passed away in August 2016. "Canyon of Gold, Buffalo Bill & The Legendary Iron Door Mine Treasure"
By William "Flint" Carter. 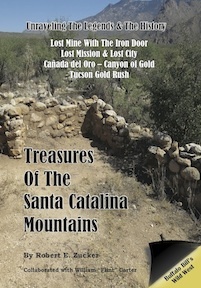 Follow the decades-long effort by Carter to prospect and mine the Cañada del Oro (Canyon of Gold) in the Santa Catalina Mountains for silver and gold. By Ron Quinn. This is a collection of stories about odd and unusual occurrences, disappearing circumstances, sightings of little people, very strange and unexplained tales, and other mysterious phenomenon. "By Robert E. Zucker. Learn how to achieve dream awareness and astral projection experiences with simple, easy to follow, techniques. By Robert E. Zucker. 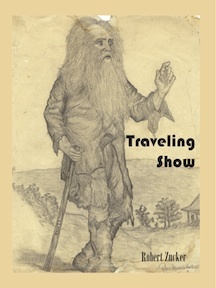 The Traveling Show is a collection of poems and artwork that ravels together a storyline of the lives of the people who pass through one’s life. The new Entertainment Book for Tucson and Phoenix, Arizona is available online exclusively. Check for this week's special offers. Purchase the New Entertainment Book Now! James Babcock has been drawing comic books in Tucson for decades. He got his publishing start with the Youth Awareness Press, Tucson Teen and Magazine newspapers. Read an download free PDF comic cartoons, drawn by James Babcock and Richard Konkle. Read reviews and profiles from other books published locally and around the country. For more articles and books, see Arizona Bookshelf and Tucson Bookshelf. Local Merchants: Antigone Books Mostly Books, Oralce Inn Steakhouse (Oracle, AZ), Summit Hut (both locations). Call Direct at 520-623-3733 and order by phone. 10% discount and only $3.50 shipping. Tax is included. For any questions, call the above number of email [email protected]. © 2015-2018 EMOL.org Entertainment Magazine. All rights reserved.